Heat the oven to 180°C/160°C fan/gas 4. In a large mixing bowl, use an electric hand mixer to beat the butter and sugar until light and fluffy. Gradually beat in the egg, bit by bit. Sift the flour, spice and nutmeg into the bowl and add the lemon zest. Mix until smooth. Bring the dough together with your hands, shape into a disc and wrap in cling film. Chill for 30 minutes. On a lightly floured surface, roll out the dough to a 5mm thickness. 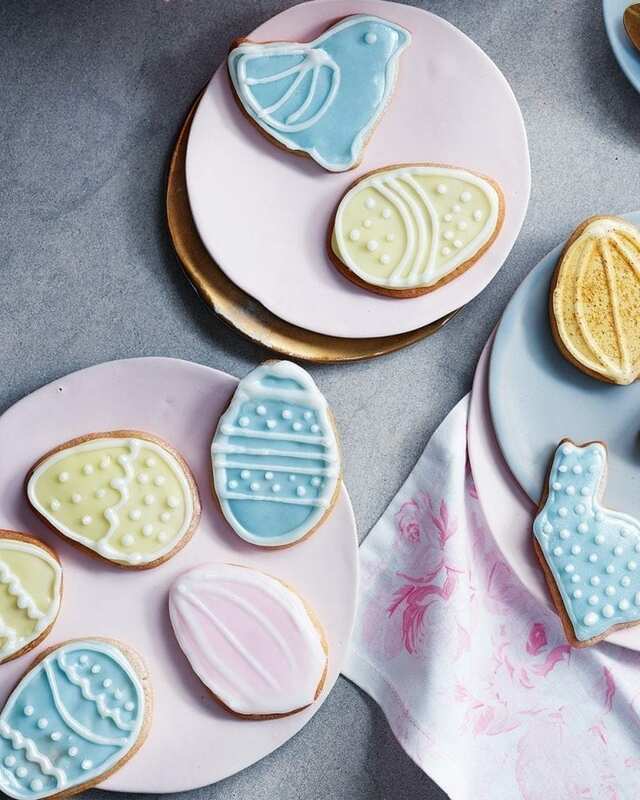 Use cookie cutter(s) to stamp out biscuits, then use a palette knife to move them to 2 baking sheets lined with non-stick baking paper. Bake for 15-20 minutes until lightly golden, then cool for 5 minutes on the tray. Transfer to a wire rack. Meanwhile make the icing. Divide the icing sugar evenly among as many bowls as you have colours, plus one for white. Stir enough lemon juice into each to make a stiff paste (use the juice from ½ lemon per 100g icing sugar). Stir a few drops of each colour into different bowls. Add a little water to the icing if it’s still too thick. This makes it easier to ice larger blocks of colour. Don’t make the white icing too runny or it’ll spread out too much when you pipe the details. Put the icing in piping bags and pipe a border around the edge of each biscuit, then fill with coloured icing. Leave to set firm, then pipe on any detail. Dust with a little glitter if you like. Leave at room temperature for 2 hours to set the icing. Next time, knead a handful of currants into the dough before chilling (step 2); don’t ice the biscuits. The biscuits keep well for 3-4 days in a sealed container or tin.